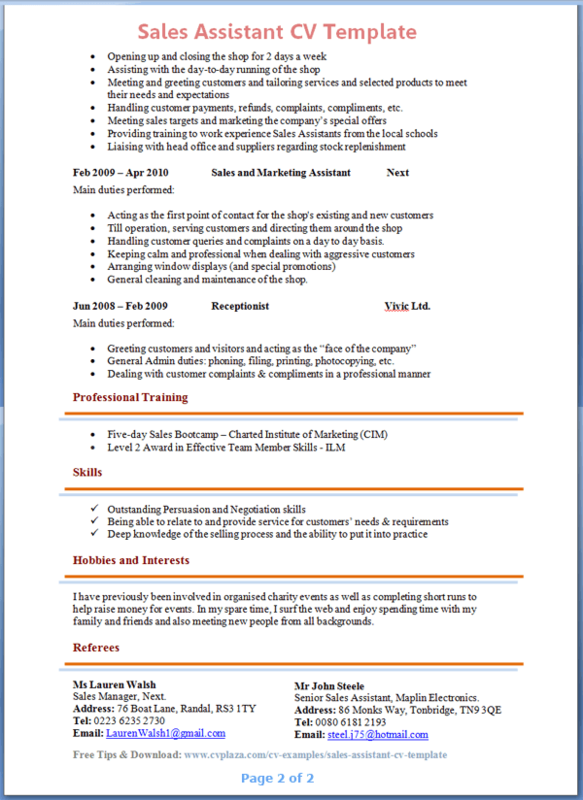 Tip: Use the Sales Assistant CV Template below as an example to help you write your own personal and fully-tailored CV. I am seeking a sales-oriented position that enables me to utilise and fortify the attributes, skills and personal qualities I currently have and to make a real, tangible difference in the company that I work for. I have always been an extremely hands-on, practical and energetic worker and am very experienced with providing excellent customer service at all times and in all circumstances. I have a “can-do” attitude, and I enjoy overcoming challenges. Handling customer payments, refunds, complaints, compliments, etc. Handling customer queries and complaints on a day to day basis. General cleaning and maintenance of the shop. Jun 2008 – Feb 2009 Receptionist Vivic Ltd.
General Admin duties: phoning, filing, printing, photocopying, etc. I have previously been involved in organised charity events as well as completing short runs to help raise money for events. In my spare time, I surf the web and enjoy spending time with my family and friends and also meeting new people from all backgrounds. Senior Sales Assistant, Maplin Electronics. Always have some sort of work experience on your CV, even if it is just a voluntary part-time position at your local grocery shop. You CV will look so much better once you have some sort of work experience included and CVs with no experience are hardly ever given any attention. Ensure that you mention the most important sales skills that a Sales professional requires in order to do their job to a high standard; Communication, Negotiation, Persuasion and Customer-Service skills. Final tip: always double/triple check your CV and ask yourself the question: “Would I really give this person [i.e. yourself] such and such salary?” You have to be honest because the first test you will face will not be in the Sales Assistant job, but on how effective you use your CV to sell yourself! CV Tip: For whom are you writing your CV? Consider your audience!